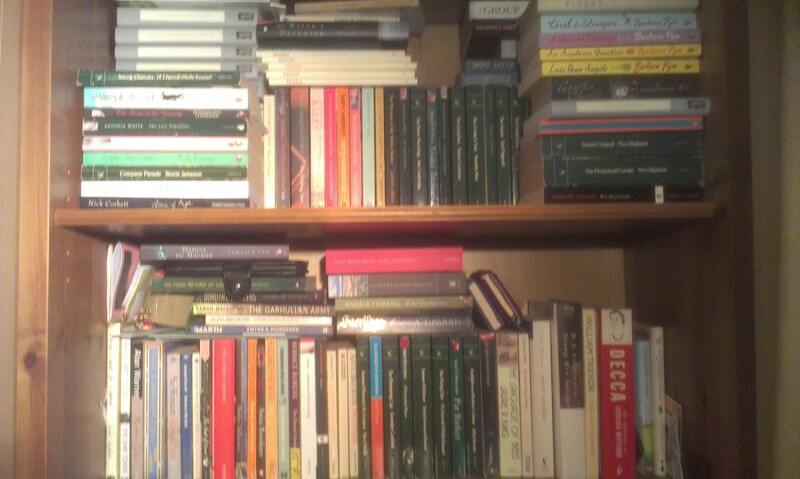 I am unashamedly book crazy. I buy books, I bookcross books (see bookcrossing.com) I catalogue them (libraything.com) – I think about them endlessly. I like people who, like me think and talk about books. I write book reviews of everything I read – although I don’t claim to be an expert reviewer I like to set down what I think about books and share my enthusiasm. I have even – much to my own surprise embraced the e-book, I have a kindle – and I like it. I like the ease with which I can carry a mass of books around with me – I like the ability to be able to download free classics – and obscure titles. It has become a marvelous add-on to my book obsession – but great though it is it will never replace real lovely books that I can hold in my hand – flick through and sometimes sniff. I am a sucker for beautiful editions – and I buy far far too many books. I like to read a lot of twentieth century women writers, Virago Modern Classics, Persephone books and other twentieth and nineteenth century classics are what I like best. I also like some old fashioned mystery and suspense novels too as my cosy escapist reads. I do read non-fiction though very little – non-fiction is something I struggle with. 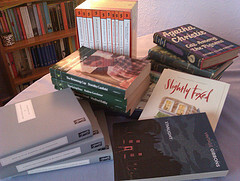 Recently I have started to read more fiction on translation, which is broadening my horizons considerably. 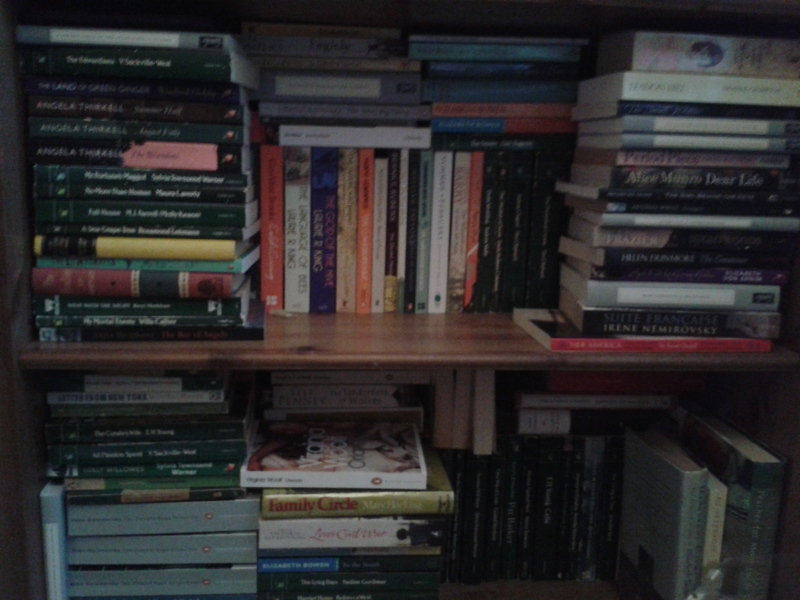 My TBR is horrendous – and so therefore I try not to acquire too many books for review – however I will consider requests to review quality literary fiction – I do not read modern crime fiction, romance, horror, fantasy or sci-fi. If you wish to, you can contact me at heavenali 37 at gmail dot com or via twitter. Thank you for visiting my blog, I’d love to hear from you. I was researching book bloggers for my book and found your blog. While I know you must be very selective in the books you read and review, I would consider myself very lucky if you considered my book A Soul’s Calling to review on your website. A Soul’s Calling is a memoir about a man who listened to his heart instead of reason. The book, a work of narrative non-fiction, is part travelogue and part hiking adventure, and is painted with shades of shamanism. A Soul’s Calling transports readers to Nepal’s rugged but enchanting Khumbu Valley where mountains speak and nature is imbued with a special kind of magic. The novel is an inspiring modern day adventure that weaves the timeless themes of living an authentic life, the consequences of power, and what a man would do for unrequited love. Scott, a forty-something attorney, is average in every way except one. He has a connection to the Other Side. He speaks to Spirit and Spirit speaks to him. He sees, hears, and interacts with an invisible realm that is beyond ordinary human perception. When Scott learns his soul has been spiritually compromised he travels to the ancient kingdom of Nepal to win it back. Once there, he hikes the Himalaya carrying a mysterious bundle and a stick laden with prayers from Luminous Beings hoping to come face to face with the greatest mountain on earth: Mount Everest. As his journey unfolds, Scott is called on to battle his fear of heights, the thin air, and his physical limitations. Powerful, sweeping, and deeply moving, readers will search their hearts as the book draws to a stunning conclusion. A Soul’s Calling is a book for our time and for anyone who believes the world can be a better place. Thank you very much for the offer Scott but I have far too many books waiting to be read a the moment and I can not committ to taking on any more. To be honest the subject matter does not really appeal to me either. Yay another Sir Arthur Conan Doyle fan! Love Edith Wharton. The Age of Innocence was wo richly textured – I know Wharton is not being complimentary about some of the upper classes, but at the same time as satirising them she makes the appeal and pull and seductiveness of those material benefits so clear. Hi. 🙂 I think your blog is awesome, so I’ve nominated you for the One Lovely Blog award. Here are the rules, if you’d like to participate: Post 7 facts about yourself and nominate 7 other blogs for the award. Of course, it’s up to you whether or not you’d like to write a post about it — I still think your blog is lovely! Thank you. That’s really kind – I don’t tend to enter those award things but I’m so glad you like my blog and thank you for popping by to tell me. Thank you I will have a look at it. Great! Let me know if you’re interested! I have read Poor Caroline and Anderby Wold – I loved them both, I have The land of Green Ginger sitting here unread – I have been saving it for about two years as it’s the last of her novels I have to read. Maybe this will be the year. Mary Hocking dies February 17th 2014. She was a great author and i know you liked her.No blogger has mentioned her passing. Oh I hadn’t heard thank you for telling me. I bet some reprints are coming. BUT sometimes book collectors do not welcome reprints,selfish but true. put October 2nd in your diary–Janet Mcneill” SMALL WINDOW is being reprinted.I have a hardback copy already.I think you will like it as AMAZON say she is like Pym Anita.Brookner and Elizabeth Taylor. I have a book by Janet McNeill sitting here tbr Tea at Four O’Clock. SORRY–SHOULD MCNEILL.Not Mvcneill as i typed. can you alter my mis spells please? ELIZABETH TAYLOR AND JANET MCNEILL.Sorry. Yes you have a great novel to read–my fave Virago ever. 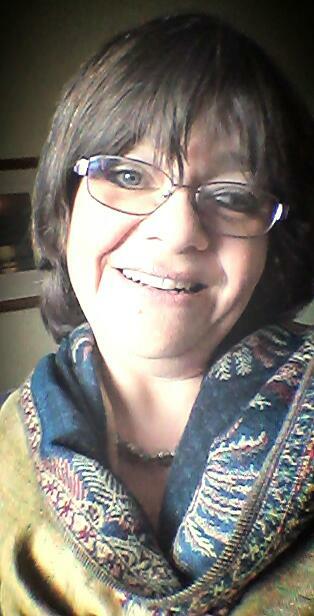 Greetings and what a fine blog you have led me too! I am in total agreement books are the best thing since paper began. I can see we are going to get on very well…I am not familiar with some of your current favourite authors but that is a good thing as i get to indulge in the unknown even more than I usually do. Thank you 🙂 welcome to my blog. I always love discovering new authors too. Thank you for your ongoing inspiration! Thank you too:) I don’t usually play the award game either. But this year everyone seems to be doing it. I have left a message about Mary Stewart on KAGGSY’S blog. Basically i would not worry about reading Mary Stewart too much.I really tried to like her and read 4 of her books but i could not take to her.They are often adventure novels. Oh right I see thank you. Truly love love your blog. Thank u very much for all your work, it is such a joy to be able to go to your page every day and feel confident that most days u post, so i can get my fix of well written, thoughtful reviews. I have been a non fiction reader entire life and somehow this yr managed to travel from memoirs to true fiction…and i couldn’t be happier, having found reviewers like u, thomas, simon, scott etc…and i am now tooootally hooked on pym, appreciating her and her contemporaries entirely…and have traveled down paths, dipping into mysteries etc as recommended by u all. Thank u very much for sharing your knowledge. As i have seen from some blogger postings, they’re here so as not to ‘bore’ their friends w/ so much bookish talk…i know they meant to be humorous, but of course truth in humor always…and one of main reasons i’m here. I noticed that you reviewed Rosie’s War a while back, saying you like true stories set in WW2. Found this photo online–have you seen it before? Oh no hadn’t seen that one. I will share it with the Mary Hocking readers group on Facebook I know they would like to see it. Thank you. Hi, I just found your blog and think it’s lovely! I’ve been wanting to read Willa Cather for a while, but I’m not sure where to start! What’s your favorite book by her? Hello. Thanks for popping by. I think My Antonia or O! Pioneers would be a great place to start. Your pals(!) at BELLOBOOKS are reprinting Richmal Crompton THERE ARE FOUR SEASONS on 25th August.They may reprint more.I cannot find out as yet.£10.99 PAPERBACK.I have told Simon Thomas–he may already know. Yes I heard from Bello by email about it. Exciting! How many of her books are being released?I could not see. I’m not sure exactly how many but a few I think. What did you think of PARTNERS IN CRIME? I thought Walliams miscast and portrayed as an idiot/loser–like he did not carry his wife’s bags at the train station.I give it 2 stas for the sets and locations. I thought it OK. I agree Walliams not right. Also time period wrong, I read this book and it is set in 1920’s when T&T aren’t married. I note that you have a kindle and yet you still read the paper (hard copy) books. Is that correct? I received a KOBO reader for Xmas in 2012 (now nearly 3 years ago) and I find that I can no longer read paper books any more. I now read all my books either on my computer or on my KOBO reader. The fact that my eyes are getting worse is one major reason why I have had to stop reading paper books. The print is just too small. I was wondering if you still had a preference for paper books over your kindle reader or is that becoming the other way around? The second major reason is that e-books are actually a LOT cheaper than paper books to buy as well. Do you know that I have not been inside my local library to borrow books, for pretty much the same 3 years since I got my KOBO reader? I dont even miss the library at all any more. Probably because my favourite Librarian had retired shortly before, and I kind of do miss her. . I still prefer paper books because there are certain editions I collect and particularly love. However I do find reading on my kindle very comfortable and it’s true some print sizes in books can be a struggle. Seems like the only way to read obscure books is to buy a KINDLE.The books are £1 to £3 i think?Must be bad news for those who spent a fortune buying ancient hardbacks.BUT i think the price of the old hardbacks do not lose their value.See Angela Thirkell novels still cost a few pounds online despite them all being ebooked. Thank you. No promises I am useless at fitting in memes which is why I so rarely do them. My tbr is terrifying so I don’t know whether I should be examining it too closely. Help. I am trying to remember the title/author of a book I read at a house I rented. The story was about a woman who had an affair and leaves her English village under a cloud to stay at an off season resort where she interacts with various people. Small book, beautifully written. Hmm not sure I can immediately bring it to mind – will give it some thought. Hotel du Lac – Anita Brookner? Book,and film? I had forgotten about this question and yes, thank you for the answer, it was Hotel du Lac. How nice to rediscover the book. Thanks again. I vaguely remember a reference to the Man Booker, not necessarily this book but perhaps another by the author. Thanks. Another bookcrossing blogger?!?! I’m following you now! Come visit and say hey over at http://www.thatssojacob.wordpress.com! Hi Ali, what a stunning blog! I could spend all day here; I can see some will power will be required! Congrats on such a great blog. Plenty to make me think and whet my appetite! Thank you Sandra. I hope you enjoy blogging. It can become addictive.